Earlier this month, punctum books released my project Gaffe/Stutter on its Dead Letter Office imprint, edited by the inimitable Eileen Joy. Taking its name from the US Postal Service's office for undeliverable mail, Dead Letter Office publishes work that remains in a state of suspension – projects that are abandoned or unfinished "yet retain little inkdrops of possibility." 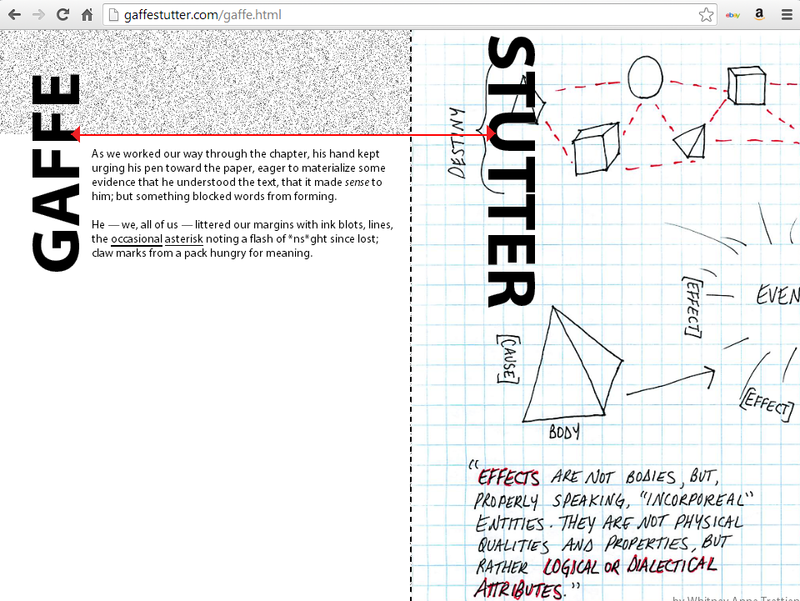 In that spirit, Gaffe/Stutter is series of diagrams, sketches, code, and fragments of HTML that, together, comprise the remnants of an uncompleted diagrammatic digital "edition" of Gilles Deleuze's magnificently schematic book, Logic of Sense. It's available as both a printed chapbook and a website. You can also download a PDF of the book for free (though the PDF won't make much sense unless it's bound, and I encourage you to support punctum books). Since the project is admittedly (and intentionally) opaque in its presentation, I want to use this post to give a little context and background. The title comes from two concepts juxtaposed in Logic of Sense: the gaffe and the stutter. Deleuze introduces them at a moment in the text when he's interested in dualities, particularly (for present purposes) the dual use of the mouth for both eating and speaking. As our primary means for ingesting the nutrition that sustains us as animals, the mouth helps us repurpose corporeal stuff, converting matter into energy; as our speech organ, it produces incorporeal events, acts of verbal communication. Since "sense" is Deleuze's primary concern throughout the book (although we might say he's actually more interested in nonsense), you can see why this dual corporal/incorporal use of mouths interests him. To pass to the other side of the mirror is to pass from the relation of denotation to the relation of expression – without pausing at the intermediaries, namely, at manifestation and signification. It is to reach a region where language no longer has any relation to that which it denotes, but only to that which it expresses, that is, to sense. The book's folds have long been the site for literary imaginings. 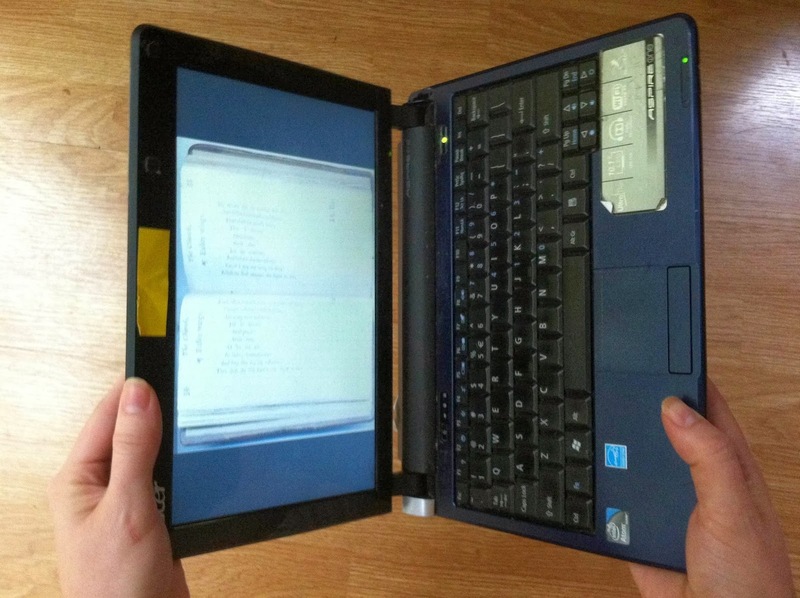 As Stéphane Mallarmé (premier poet of the gutter) writes in his essay The Book as Spiritual Instrument, "Folding is, with respect to the page printed whole, a quasi-religious indication; the large sheets are less striking than the thick stacks of pages, which offer a tiny tomb for the soul." Blanchot and Derrida extend this meditation in works both titled The Book to Come, as does Deleuze himself in his treatise on Leibniz, Le Pli or The Fold, in which all of being becomes a kind of reading process, endlessly folding and unfolding the pages of the great and total Book of Nature. 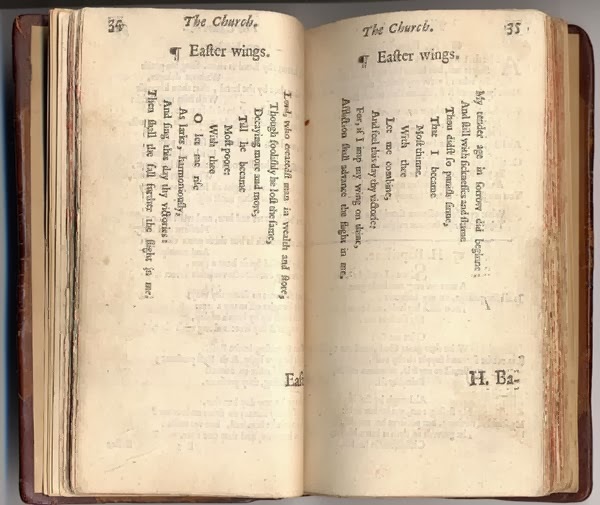 But we could look elsewhere for theories of the book's gutter – for instance, to George Herbert's famous pattern poem "Easter Wings." 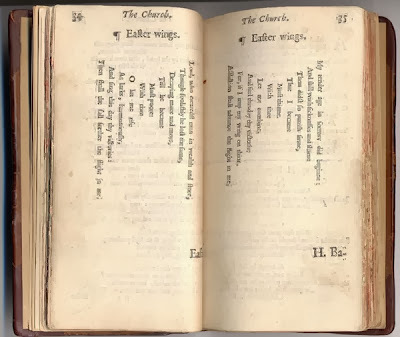 In "Easter Wings," lines take flight, flipping the orientation of the page (or deterritorializing the page, if we want to stay with Deleuze and Guattari's terminology), reconfiguring the relationship between the printed text, its paratexts, the book, and its reader. As Randall McLeod writes, "untied, the wings of the book unfold as an angel in the grasp of the woman to whom the book was given. The diptych is not a merely visual field; it is also tactile and metamorphic." McLeod ends his essay with an image of hands folded in prayer, like the wings of the poem or the bound pages of a book – his own visual metamorphosis of the essay that precedes it. This is about the point at which Gaffe/Stutter begins to make its own kind of sense. Stuttering and stammering across the surface of the page is a series of diagrams and code, pointing in one direction; pointing in the other is the preface, words that, as written language, spin a kind of meaning not present in the stutter of code. Yet this linguistic depth bumps up against the materiality of the page, as words twist and leap across gaps and the gutter of the book. Although Johanna Drucker's wonderful new pamphlet Diagrammatic Writing wasn't available when I was writing the preface, her work gives a perfect description of what I (with some inspiration from Herbert and McLeod) was attempting: "the associative field within the text creates endless opportunities for branching or breaking the line to follow lines of thought / breaching the code of compositional conduct." 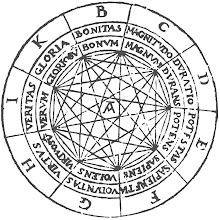 If the chapbook is a dead letter to Deleuze, the website revives the original (and unfulfilled) dream of producing a diagrammatic reading of Logic of Sense – but in such a way that a webtext of the dead letter becomes its fulfillment. Although Deleuze's terminology (and its deployment in contemporary work) can be alienating, his ideas have, for me, been incredibly productive. My favorite moments with his work are not when it seems to be offering us a new vocabulary for doing the same types of traditional close readings, but rather when, as with McLuhan's or McLeod's work, it presents a kind of schema for making things – for plugging into a set of ideas and rewiring them. In the C for "culture" section of L'Abécédaire, a series of interviews on topics from A to Z, Deleuze tells the story of how, after The Fold was released, he received two curious letters: one from an organization of origami artists, the other from surfers. Both claimed intimate knowledge of folding: "We understand, we completely agree," the surfers said, "because what do we do? We never stop inserting ourselves into the folds of nature." Quoting Plato, he concludes in the clip above (which starts around 8:19) that philosophers are not writing about abstractions but about concrete things – things in the world, which we all engage with at some level. 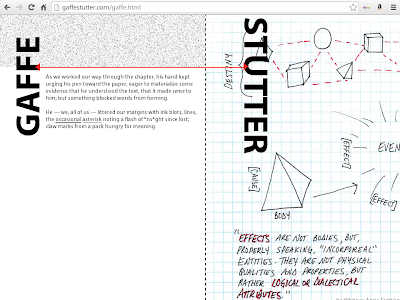 Gaffe/Stutter is my very small attempt to turn the product of reading – the digestion of knowledge – back into a process, materializing my path to understanding by making something.